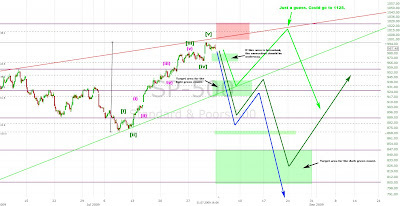 Technical Analysis and Elliott Wave Theory: No confirmation yet. Last Saturday I expected the market to reach the red resistance line before turning down. On Thursday this level was reached but we haven't got a confirmation yet, that the correction is underway. A break below 980 should confirm it. On Friday the SPX and the VIX were up. Normally the following day is a down day, thus I expect the confirmation to happen on Monday. 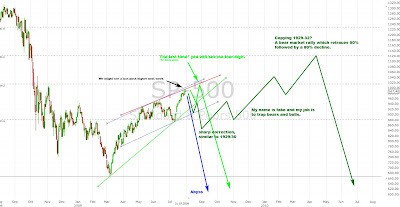 If the light green is the correct one, the market should turn between 920 and 950 and reach 1020-40 or 1125 later this year. If 920 and 880 is breached, my "evil" count or a new downtrend should be underway.